40% discount on Standard Course available for students who originally needed prerequisites and choose to retake to improve guaranteed score to scholarship level. As soon as you sign up for our program, you will be given a link to set up a meeting with your assigned accountability coach, who will be your primary point of contact and supporter as you make strides towards your goals. He or she will be spending at least two to three hours a week with you, getting to know you and your needs, proctoring diagnostic exams and practice modules, and facilitating communication between you and the tutors. She will then continue to follow up with you via text or Facebook throughout the week, ensuring that your questions have been answered and your needs have been met. Following your meeting with your accountability coach, he or she will grade your diagnostic and practice material, collect your questions, and communicate your needs to specialist tutors, (each with at least a Bachelor's Degree in their chosen field, but whose first priority is student comprehension), so they can present comprehensive seminars covering as many of your questions for that week as possible. Lectures will be presented via Zoom, with the potential to share screens, interactive whiteboards, etc. (Please download Zoom app prior to initial meeting with accountability coach.) Emphasis will be placed on clear, comprehensive of explanations about why things work they way they do, based on specified learning style, rather than simply memorizing formulas. Schedule will depend on student needs and tutor availability, and will be determined between student and accountability coach. We strongly believe true understanding is the best way to gain confidence, and that gaining that understanding is usally a lot easier than it seems. We will provide an easy-to-understand road map of how you can understand these ideas as well, so that you will not only be prepared for the exams, you will also be sure to have a solid foundation for the material you will actually need in college. Following the seminars, your accountability coach will continue to follow up with you to ensure all questions have been answered. 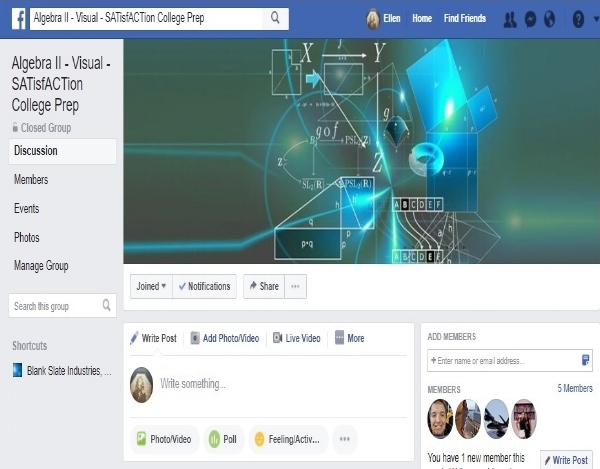 If you or other students have remaining questions, tutors will be available via the private Facebook group for you to continue asking questions until you truly understand. You will also be able to discuss questions and other topics with other students and accountability coaches.